119. CAPTAIN JAMES COOK. Issued by W.H. & F.H. HORNIMAN & CO., LTD. (1910). 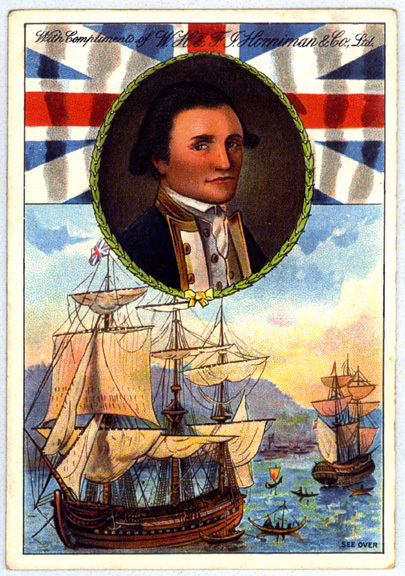 Card unnumbered; from a set of 10 entitled "Naval Heroes". Size: 4.6" x 3.22". Recto: Portrait of Cook set over a Union Jack and a scene with two ships. At top: "With Compliments of W.H. & F.H. Horniman & Co., Ltd. At lower right corner: "See Over". Verso: NAVAL HEROES | CAPTAIN JAMES COOK. | Circumnavigator, born 1728. Seaman, 1755. Lieutenant, 1768. Sailed in Endeavour, 1768, for Tahiti, round Cape Horn, charted coast of New Zealand, East Coast Australia, also New Guinea, 1769 to 1770, returning by Cape of Good Hope. Commander, 1771. Attempted to sail round North America from Pacific, 1776, in the Resolution. Discovered Sandwich Isles, 1778; touched at Hawii, 1779, where he was murdered by natives. ARTHUR HILL HASSALL, M.D., the great Food Analyst, says: "I have made a careful microscopical and chemical analysis of HORNIMAN'S TEA (In Packets), and find it to be PERFECTLY PURE. I have the greatest confidence in recommending the Tea to the public as being absolutely pure, thoroughly reliable, rich and delicate in liquor, gratifying and economical." | FULL WEIGHT WITHOUT THE WRAPPER. | Third Educational Series of Picture Cards issued by | W.H. & F.H. HORNIMAN & CO., LTD.